I'd like to make use of the special iOS symbols found in Apple Symbols font, e.g. the "Reload" and "Action" glyphs. In Snow Leopard, I could obtain and insert them via the "special characters" pane where I could show (and select!) all the symbols of any given font. In Lion, however, this feature seems to be missing (said pane now only contains some given character ranges) and when I preview the entire font repertoire in font-book, I can't select and insert text from the preview area. Is there a way to obtain those symbols in a copyable form (i.e. to insert them into another application) on Lion? 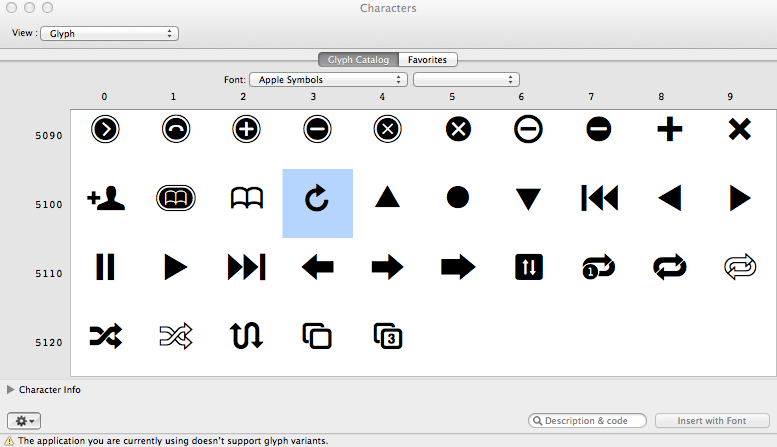 Those "iOS symbols" shown in the screenshot above are glyph variants that are specific to Apple Symbols. For example the turned arrow icon is a variant of Ꮿ. There doesn't seem to be any way to show them in 10.7's Character Viewer. costs €30, which is expensive, but it will do what you need. You can download a trial version. Not the answer you're looking for? Browse other questions tagged lion font unicode font-book character-map . 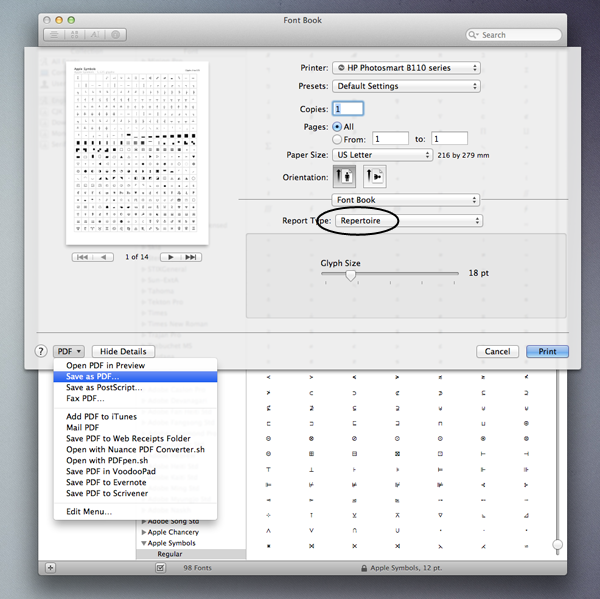 How can I convert a font from Font Book to .ttf? How do I enable a font? What font is used for keyboard symbols? How to access Greek symbols on OSX (Mavericks)? After adding a font with Font Book, is it safe to delete the original file? What is the default “cursive” font for macOS?